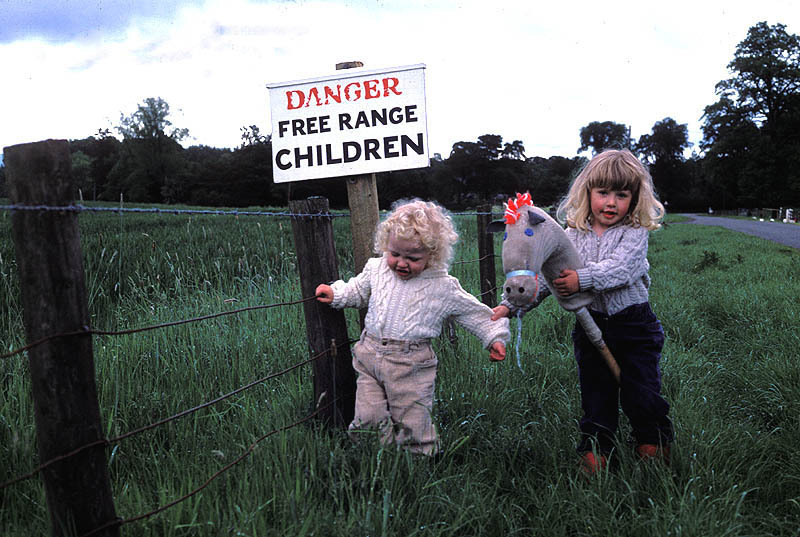 I was a free range kid. Sounds like a free range chicken, I know, but it was more fun than that and it had a better outcome. I wasn’t an ingredient for the church chicken pie supper, for example. Go ahead. Let your children run wild. You just might be making them smarter if you do. Free range kids is a term used in an an entertaining blog by Lenore Skenazy dedicated to discouraging overprotective adults and letting kids live their lives. It seems free range kids are rare these days. What they are are children whose parents don’t schedule everything for the kid down to the millisecond, who let the kid explore unsupervised, get into a little trouble, dream up their own games, their own rules, and learn to be self-sufficient. Of course, nowadays it seems letting a kid just be an unscheduled kid for just one second is tantamount to child abuse in most circles. And that’s too bad, because it’s one factor that threatens the competitive edge of the United States on a global stage. Yes, it’s true kids have to learn more and learn better in school. But if they just know a lot of facts by rote, that’s not going to get us anywhere. That’s where free range kids ought to come in. If you explore, and use your imagination as a kid, you wire your brain to solve all the unexpected, weird problems that will come up when you’re an adult. Instead, we wrap the kids in a stifling cocoon. If we think of any danger that could so much as scratch a kid, we keep them away instead of letting them learn what’s dangerous and what’s not. No wonders bored kids just sit around and play video games. We took all their fun away. I’m all for supervising kids, but really. Exhibit A is an article about a school in New Jersey for kids that’s basically on a farm, where the children learn by doing. It’s very outdoorsy, too. According to the Web site Boingboing, state regulators came in and ordered the school to fence off the stream, cut all tree branches lower than seven feet off the ground, make the kids wear shoes indoors and get rid of or stash away a cat that hangs around the school. Kind of defeats the purpose of the school, no? Yeah, if I were a parent I would want reasonable protections. But remove all tree branches that could possible clonk a kid in the head? God forbid the kid discover that unwisely swinging from a tree branch can lead to a bruise. Cue the codger story about how it was better in the old days, but it’s true. When I was little, I’d spend an entire afternoon exploring the mountain, alone, behind my house. Or I’d go into town, and it was up to me to find friends, and maybe join a game of football. No parents scheduled anything. And it was up to me to get home in time for supper. If I didn’t, I’d just have to fix myself something to eat. I think the whole lifestyle as a kid made me more creative, imaginative and able to think on my feet. What kinds of kids are we creating where everything is so controlled? I wonder if they’ll ever be make their own decisions. I know some college professors who tell me some students are totally at sea when they arrive on campus, because they never had to make a decision for themselves, and are utterly lost. I have to completely agree with New York Times columnist David Brooks, who said that Amy Chua, the woman who wrote “Battle Hymn of the Tiger Mother,” actually coddled her children too much. Chua hit a buzzsaw of criticism because she forced her kids to practice music for hours, had exacting standards for academic achievement, and was kind of mean when the kids fell short. Many parents said Chua was too mean. “She’s protecting them from the most intellectually demanding activities because she doesn’t understand what’s cognitively difficult and what isn’t. I’m obviously no parenting expert, but I have unsolicited advice anyway. When your kids get home from school today, bundle them up and send them outside.Then leave them to their own devices. This entry was posted on February 15, 2011 at 4:04 pm and is filed under Uncategorized. You can follow any responses to this entry through the RSS 2.0 feed. You can leave a response, or trackback from your own site.